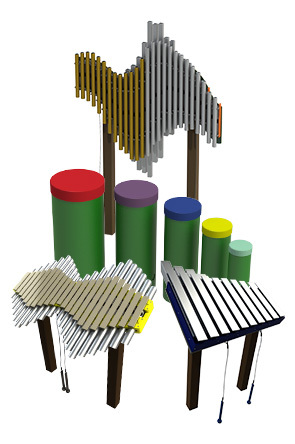 Inspire fellowship, imagination, culture and play by adding an outdoor music park for the community. The Deluxe Ensemble offers a delightful quartet of instruments specially engineered so that anyone regardless of musical skill level or abilities can step-up and play, even if it's their first time. All of instruments in the ensemble are cleverly tuned in harmony together in a way that precludes any chance of playing off-notes. This fun and inclusive ensemble features the super popular Tuned Drums, Yantzee Bass Metallophone, Imbarimba Marimba and the bold Swirl Metallophone. Each component can be performed individually or simultaneously by up to 2 people. The 5 piece Tuned Drums produce rhythm, Yantzee contributes as a bass and the Swirl and Imbarimba work together to create a melody. The Deluxe Collection can be arranged in many configurations to create a one-of-a-kind aesthetic and musical experience. Built ready for outdoor use, this collection is configured for in-ground mount installation with durable recycled plastic posts. All 5 of the Tuned Drums are available in 'Adult' or 'Toddler' finish heights and come standard with green barrels and a choice of cap colors as shown.